I run quickly through the ocean’s edge to make a good dive past the breakers. It’s about timing, and not getting tossed and tumbled. I spent quite a bit of time strolling the foamy edge watching the waves ebb and flow in an infinite dance. I just couldn’t decide what to do – stay on the shore and soak up the sun? Or let go and dive in? I choose to dive… it’s in my nature. Head first so I can be where the waves gently swell and I can wade and float and feel the pull of the ocean. Something so much larger and more powerful than me that I let go and let it move me. No control, just enjoyment felt fully down to my soul. It’s hard to find that balance in life, to live it to the fullest. I talk, but I want to sing and sign… I walk with pain daily, but I long to dance. I long to dive into life and get past the mess where I know I’ll find love and joy and freedom and life abundant. For some of us, it is not in our nature to dive. We like to walk along the shore. However, for me, I’ve allowed God to lead me and it makes diving in so much better and more natural feeling! Thanks for stopping by… I love how many of us are seeing the word with such similar views. I was just reading other posts and finding a lot of “God’s leading” in the diving… That’s what is so fun about these FMF words… how so many of us are in the same “place” when we start writing! Thank you for your encouragement to your readers to take the plunge, dive in and have the abundant life that the Lord desires to give us. Beautifully written! I NEED that picture you posted! 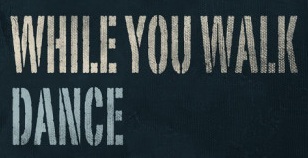 “While you Walk, DANCE!” That’s where I live Girl! Dancing on my wee little dash! Great post! Yes, that’s you! Dancing on the dash! I find a lot of pictures on google images…I like having a picture at the top of the blog post that applies. Lots of inspirational posters and framed art work available on allposters.com too… Great for the wall while you write!